We have a range of high quality hand made gifts including lavender sachets, cupcake teatowels, framed prints, appliqued baby singlets, bibs and muslin wraps and girls's tops. We also have a range of hand made bags. Fabrics and styles change according to availability. We supply some of our giftware ranges wholesale, please contact me if you are a shop interested in pretty, shabby chic giftware. I now have my exclusive antique sewing machine print as a card, great to give to a sewing friend. Card measures 14 x 11cm, is blank inside for your message and comes with envelope. Pretty 8 x 10" print of bottles and rose from an original painting by Australia artist Gail McCormack. 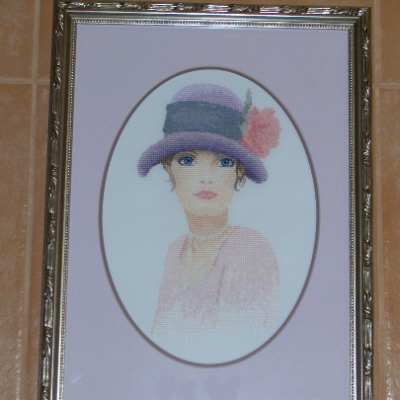 Signed on the back by the artist and framed in a hand-painted antique finish frame by Gentle Threads. Frame may vary from photo as we use vintage and one-off frames. This is one of most popular prints. If showing as out-of-stock please contact me to order. 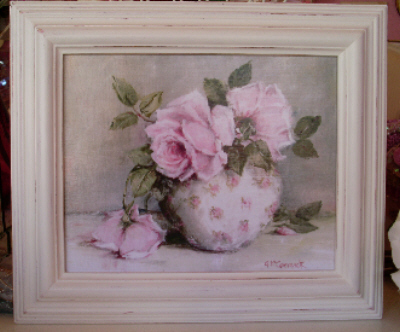 Gorgeous 8 x 10" print of pretty pink roses in a chintz bowl from an original painting by Australia artist Gail McCormack. This print co-ordinates with a couple of our other floral prints. 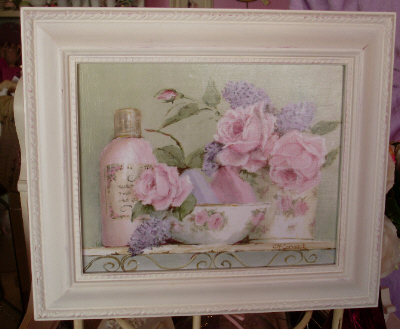 Signed on the back by the artist and framed in a hand-painted antique finish frame by Gentle Threads. 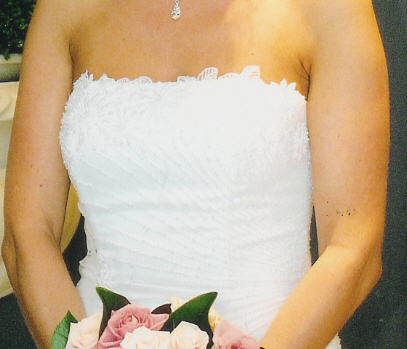 Frame may vary from photo as we use vintage and one-off frames. 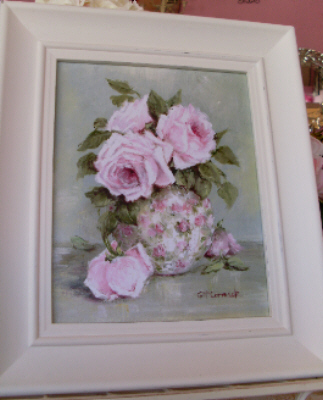 Gorgeous 8 x 10" print of pretty pink roses in a chintz jug from an original painting by Australia artist Gail McCormack. This print co-ordinates with a couple of our other floral prints. 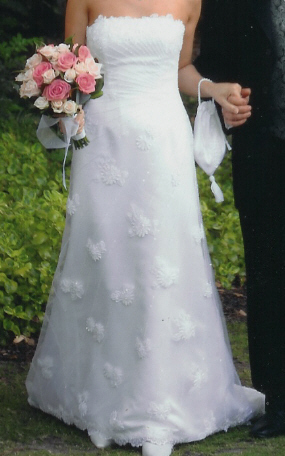 This is one of myfavourite designs, so pretty! 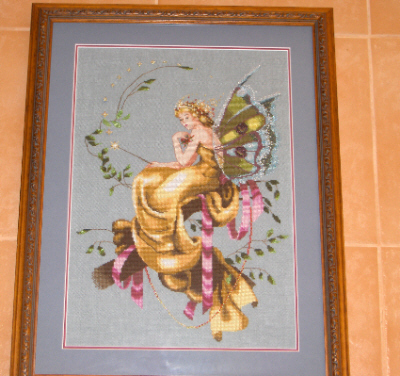 Signed on the back by the artist and framed in a hand-painted antique finish frame by Gentle Threads. 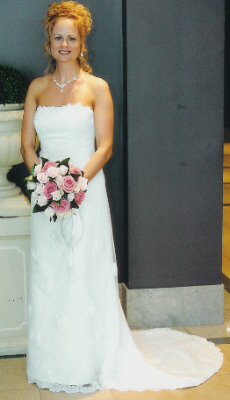 Frame may vary from photo as we use vintage and one-off frames. 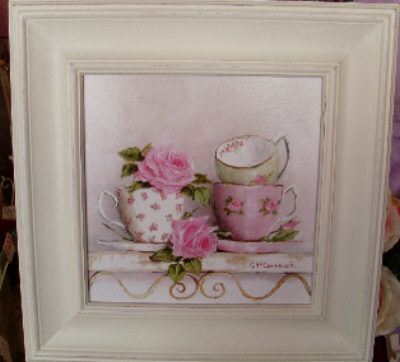 Lovely 8 x 8"print of stacked teacups with roses from an original painting by Australia artist Gail McCormack. Signed on the back by the artist and framed in a hand-painted antique finish frame by Gentle Threads. Frame may vary from photo as we use vintage and one-off frames. One of our most popular prints.